Even as it airs what could be considered its dirty laundry, Puma continues to push the ball forward on corporate sustainability. The apparel company has just published a detailed environmental profit & loss (EP&L) statement for 2010, valuing the costs to the planet incurred by its operations across its supply chain. Update: In 2010, the company was responsible for €145 million in environmental impacts -- a big jump from the €94.4 million in impacts from Puma's water and greenhouse gas emissions that the company reported in 2011. The new figure reflects three additional areas of impacts: Land use impacts, waste and "other air pollution" -- everything emitted to the air in Puma's supply chain that is not a greenhouse gas, such as carbon monoxide or VOCs. But in lifting the curtain on its supply chain impacts, Puma has done something extraordinary: It has published a granular map of how it affects people and the planet, and created a roadmap for Puma -- as well as its many suppliers and its competitors in the industry -- to focus their efforts to reduce those impacts. "[I]f we treated our planet as we treat any other service provider, PUMA would have to pay €8 million to nature for services rendered to our core operations such as PUMA offices, warehouses and stores in 2010, alone," writes Jochen Zeitz, Executive Chairman of PUMA SE and Chief Sustainability Officer of its parent company, PPR, in the introduction to the EP&L statement. "An additional €137 million would be owed to nature from PUMA's supply chain of external partners that we share with numerous other companies, and where we have less influence. So if PUMA is to successfully reduce its environmental impact, we have to address the activities of our supply chain partners that generate 94 percent of our total environmental impact." Working with its supply chain partners -- and with its competitors -- is a key focus of the EP&L. The report goes a long way to giving any company a step-by-step manual for how to define, identify and measure the eco-impacts of their operations. It starts with a definition: "An Environmental Profit & Loss Account is a means of placing a monetary value on the environmental impacts along the entire supply chain of a given business." • A strategic tool, helping to pinpoint areas to develop more sustainable materials and methods, such as more sustainable cotton and rubber and reducing greenhouse gas emissions. • A risk-management tool that gives the company an early view of emerging risks, for instance around availability of water for production and costs associated with GHG emissions. • A transparency tool that will, according to Puma, "enable us to make better, more informed business decisions that take account of environmental impacts as well as more traditional financial and operational considerations." Looking at where Puma's impacts actually happen provides very few surprises. Of that €145 million, €137 million comes from its supply chain. Which means Asia, by and large, but Puma has sketched out its supply chain to four levels beyond its own operations and included the regional breakdown of where impacts lie. 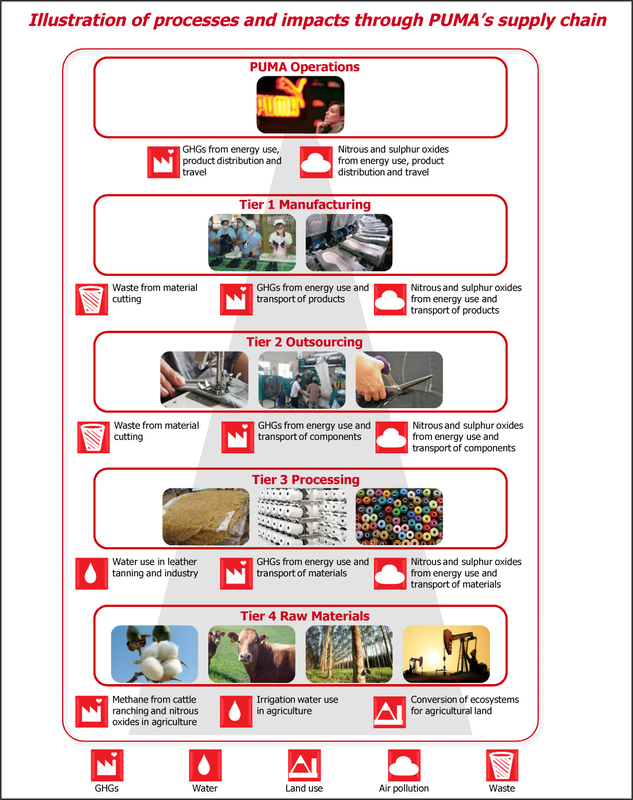 The chart below shows what each of the tiers in Puma's supply chain is responsible for; according to a detailed breakdown in the EP&L statement, Tier 4 suppliers are responsible for 57 percent of total impacts, and suppliers in the Asia-Pacific region are responsible for 66 percent of total impacts. A case study included in the report looks at how complicated it can be to calculate the eco-impacts of Tier 4 suppliers can be. In 2010, Puma sourced 4.8 million square feet of leather from Australia -- equivalent to 1.1 percent of Australia's total leather production. Puma took the known data about meat and leather production in Australia, conducted extensive, if somewhat hypothetical, calculations on those data and came up with a figure of €11.7 million in eco-costs from leather sourcing in 2010. • At €47 million each, our greatest impacts are from the use of water and the generation of greenhouse gas emissions. • The conversion of land for agriculture for key raw materials such as leather, cotton and rubber is our third greatest impact at €37 million. • Other air pollution affecting acid rain and smog and the impacts of waste are less significant at EUR 11 million and €3 million respectively. Though Puma strikes a largely humble tone throughout the report, it's difficult to overstate the importance of what the company has done with its EP&L. Not only is Puma the only company of its size -- and perhaps the only company in the world -- to offer this kind of transparency into its impacts, but it's also providing a roadmap for any company to start thinking about and acting on its supply chain impacts. The company also closes out the report with a call for support, asking researchers, scientists and corporate sustainability experts to weigh in on the data Puma is presenting and how it can be improved. And Jochen Zeitz issues a call for collaboration in his introduction, calling on his supply chain partners to work to address the communal impacts wherever possible. "While we recognize that this is our responsibility, it is at the same time the responsibility of numerous other companies," Zeitz writes. "In order to make a real change we, along with our industry peers, have to collaborate and work responsibly to help reduce the impacts of external supplier factories and raw material producers at least to a point where nature can recover rather than being depleted further, resulting in environmental damages that cannot be undone."